From the outbreak of WW1, getting food onto the table became increasingly difficult. We have been researching how the people of the Avenues were affected and responded. The mother Isabella Wood grew up on a farm in Berwickshire. In 1881, aged 20, her occupation is given as a ‘farm servant’ but, by WW1, she was living at 57 Seventh Avenue with six children and her three sons in the forces. We know that Isabella donated gifts to the Tyneside Scottish (January 1915) and lettuce and flowers to Northern General Hospital (August 1916). She wanted to do her bit. It may well be that she and her husband took advantage of the council’s provision of allotments at St Gabriel’s and elsewhere and utilised skills she’d acquired growing up in the Scottish countryside. Sadly, on 18 April 1917, her son, Robert, died of wounds received in France. 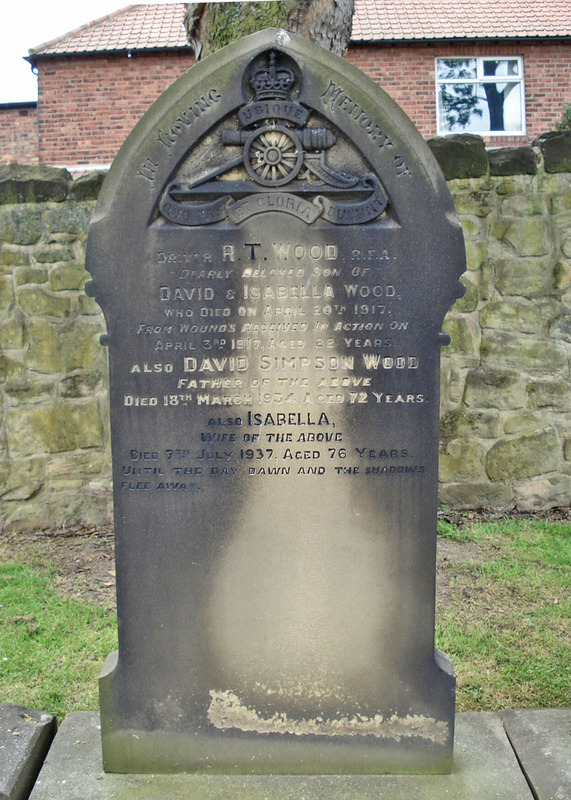 He is buried, with his parents, in Byker and Heaton Cemetery. 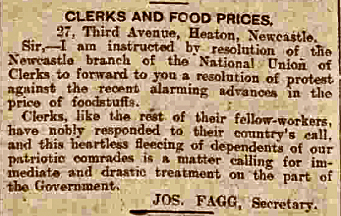 Meanwhile, Amos Watson of 63 Second Avenue (a fitter) and W J Adamson (a joiner) of 36 Sixth Avenue served on the General Purposes Sub-Committee of the Newcastle Food Vigilance Committee, set up by the labour movement to protect the interests of workers and their families from shortages, profiteering and poor quality food, in response to what were seen as the vested interests of many members of the official Food Committee. The shopkeepers Life was difficult for food wholesalers and retailers too. 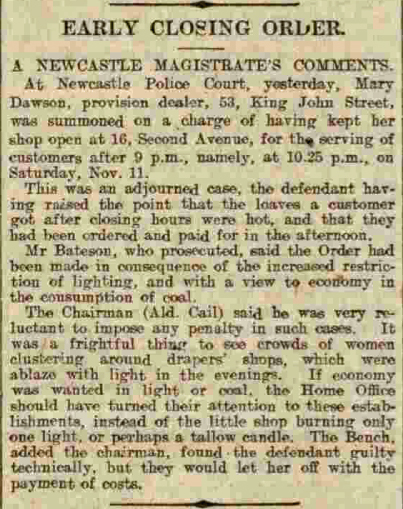 Not only did they have to cope with shortages and rising prices, just like their customers, but concerns over air-strikes and coal shortages led to restrictions on lighting and opening hours. The press reported that Elizabeth Maughan (possibly Florence Elizabeth Monaghan), of 90 Second Avenue, was fined 5 shillings for not shading her lights in 1916. Those who contravened the new laws were named and shamed in the press, although sometimes they elicited sympathy even from the authorities. The Bench found Mary technically guilty but they let her off with only payment of costs. This article was researched and written by members of Heaton History Group for our ‘Heaton Avenues in Wartime’ project, which has been funded by Heritage Lottery Fund. An exhibition, ‘Feeding the Avenues’ , which includes illustrations by local artists, will be on display at the Chillingham pub from early August until late September 2015. This entry was posted in Group Activites, Research and tagged allotments, Amos Watson, Elizabeth Maughan, Florence Elizabeth Monaghan, Isabella Wood, Joseph Fagg, Mary Dawson, Second Avenue, Seventh Avenue, Sixth Avenue, St Gabriel's Allotments, Third Avenue, W J Adamson on July 31, 2015 by oldheaton.